I'm fighting a lot recently with a bad habit I've had for most of my life: clutter. To be clear, I'm not what a diagnostician would classify as a "hoarder". My wife and I have always kept a fairly clean house (Cat & dog hair aside!) and there are no hidden health hazards lying about. However, I grew up a tinker and never wanted to let stuff go becaue "it might come in handy later". Especially when it comes to tech goods, this is a valid retort - who hasn't gone to the junk drawer and found just the right charger, or an extra Cat5 to plug in that new gadget? It doesn't excuse overloading on these items, though. Something unfortunate I've realized is that I almost never go back to these items. Cables & small peripherals are either actively in use, or they're retired permanently. 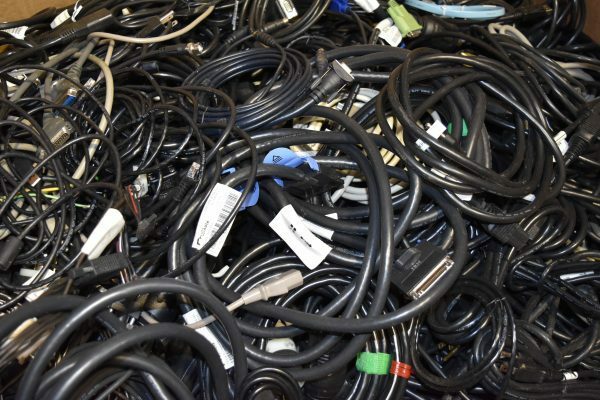 On the off-chance I've needed a particular thing, I'm just as likely to run to the local Big Box and buy exactly what I need (or have it delivered via online stores) as I am to rummage through the various hidey-holes I have for old cables. As I fight through my backlog of "I might need this someday! ", I'm constantly reminded of both how fast things go out of date and how many minute variations there are on the same item (see: USB tips for one example, or HDMI cable versions). It's incredible to open boxes from just a few years ago and see cables that nothing in my home can connect to anymore. It makes me a little sad, but it's great motivation to chuck those space-fillers and feel good about it! Scrap: Stripping home electronic & PC cabling for scrap copper can be labor-intensive, but if you're going to be sitting in front of the TV anyway it's not a bad way to turn this stuff into cash. The best profits tend to come from PC gear with gold (motherboards, CPUs, etc), but copper's a fair player in the metal markets. Expect to get a few bucks per load of wire if you're able to do this locally. Recycle: Many places offer specific recycling for e-waste. If you're near a Best Buy, they're known for having "Recycle Electronics" boxes near the front of each store. I've seen similar setups are Target & Wal-Mart in our area. Some public facilities (dumps/landfills/etc) have e-waste specific drop-off points as well. It's fun to wonder how much of the metal on your current computer might have come from recycled waste, and how many individuals handled that waste before it became part of your gear. Donate: Thrift stores, some schools/extracurricular programs, local makers spaces. There are many options in this area, and it's a simple as dropping off your box and walking away. Some chains will offer tax receipts if you've got a load large enough to be worth documenting. We prefer the donation route. There's a great organization near us that specializes in providing shelter for abused/neglected women & children, and they're glad to take our stuff. We feel good knowing that no matter how they choose to dispose of it, it's going towards a good cause. That feeling of contributing to someone else is one of my greatest motivators when I get in the mood to reduce my various "collections". What kinds of things "accumulate" in your spaces, and what tricks have you found to get rid of them? Ping me on Twitter (@ADotMartin) with suggestions or stories!